Hello everyone and right now I'm writing this in the sunny town of Valencia in Spain, spending the last week of the school holidays (cry) in the sun! 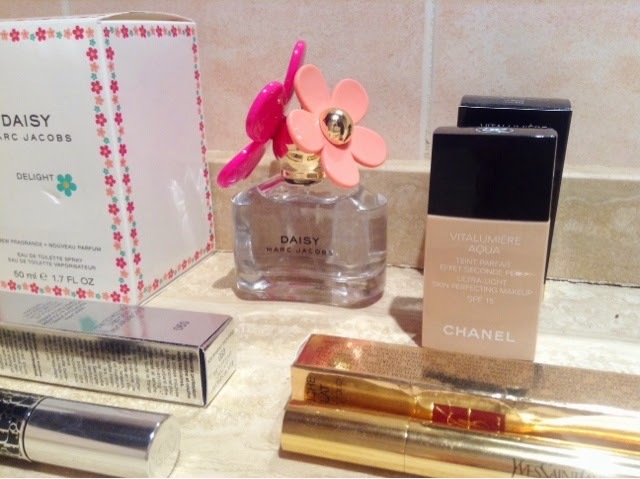 As you probably guessed, before boarding the plane and arriving in Spain, it was inevitable that I would end up in the makeup counters at Duty Free, where I picked up a few goodies - ones I'd waited ages to get my hands on. First of all is a perfume I'd had my eye on for a while since the bottle is so beautiful, but I'd never given it a smell until I got to the airport - then I knew I had to have it! 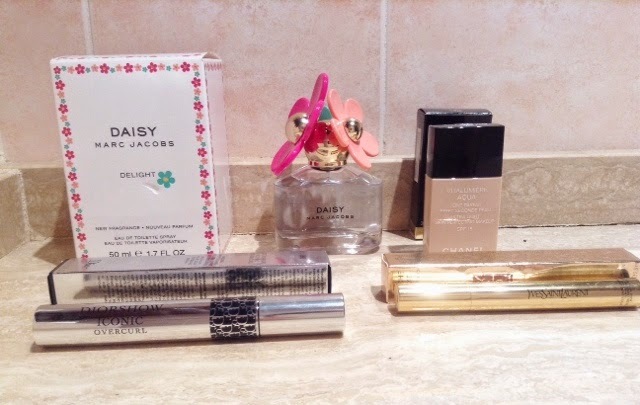 It's the Marc Jacobs Daisy Delight and is described as 'a playful surprise, a rush of happiness' and is like a younger and more sweet version of the original Daisy scent, and I much prefer this one! 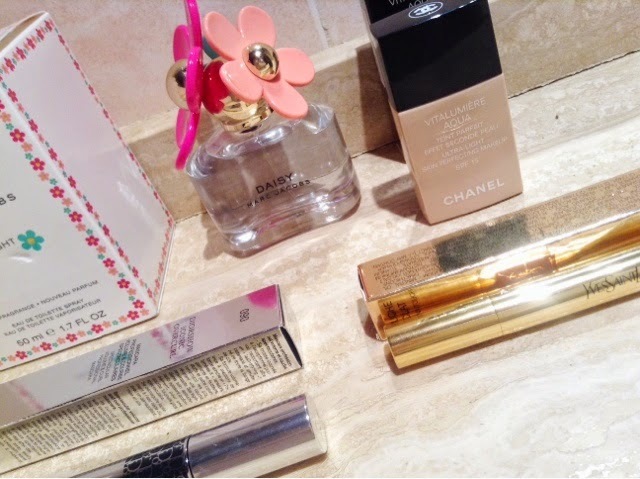 I also was excited to pick up the incredibly hyped Chanel Vitalumiere Aqua foundation, which every youtuber seems to love! I loved it from the first time I tried it, it's a thin consistency with light coverage, but it makes your skin look fresh and gorgeous - without looking like you're wearing makeup! Next is from Dior and I got their Diorshow Iconic Overcurl mascara, which I didn't intend to purchase but after the new It-lash mascara was sold out, this is what the lady at the counter recommended, and I'm so glad! It has a spoon-like wand and is amazing for lengthening, thickening and as the name suggests, curling my lashes! Finally, on the plane I got the ever famous YSL Touché Éclat highlighting pen, which is a pinky peach shade and I'm excited to use it as a highlighter very soon. That was all the goodies I picked up on my little duty free dash, I hope you're all having a fab holiday and if you're going anywhere nice, have some inspiration on what's good on the duty free counters! I am a sucker for duty free shopping! Love your purchases!